Annual (1), or perennial (1). Stolons absent (1), or present (1). Culms decumbent (1), or prostrate (1); 5-15-30 cm long; rooting from lower nodes. Ligule a fringe of hairs. Leaf-blades lanceolate. Inflorescence composed of racemes; deciduous as a whole; subtended by sheathless blades; exserted (1), or enclosed (1). Peduncle widened at apex; disarticulating. Racemes single; erect; lanceolate; unilateral; bearing few fertile spikelets; bearing 1 fertile spikelets on each (1), or 2 fertile spikelets on each. Rhachis broadly winged; foliaceous; folded transversely to form a capsule; terminating in a sterile spikelet. Spikelet packing adaxial; 1 -rowed. Spikelets solitary. Fertile spikelets sessile. Spikelets comprising 1 basal sterile florets; 1 fertile florets; without rhachilla extension. Spikelets elliptic (1), or ovate (1); dorsally compressed; 4.399-5.439-6.36 mm long; falling entire; deciduous with accessory branch structures. 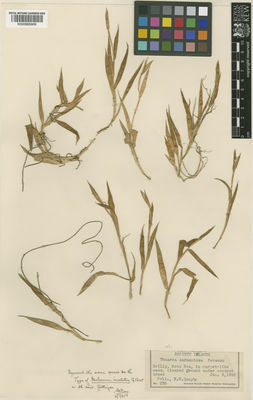 Glumes one the lower absent or obscure; shorter than spikelet (1), or exceeding apex of florets (1); thinner than fertile lemma. Upper glume ovate; membranous; without keels; 3-4 -veined (1), or 5 -veined, or 6-7 -veined (1). Upper glume surface pubescent. Upper glume apex acute. Basal sterile florets male, or barren; with palea. Lemma of lower sterile floret ovate; membranous; 5 -veined; acute. Fertile lemma elliptic (1), or ovate (1); indurate; without keel; 5 -veined (1/1). Lemma margins flat (1), or involute (1). Lemma apex acute. Palea indurate. Africa, or Temperate Asia (1), or Tropical Asia (1), or Australasia (1), or Pacific (1). Andaman Is., Bangladesh, Bismarck Archipelago, Borneo, Cambodia, Caroline Is., China Southeast, Cocos (Keeling) Is., Cook Is., Fiji, Gilbert Is., Hainan, Hawaii, Japan, Jawa, Kazan-retto, Laccadive Is., Lesser Sunda Is., Madagascar, Malaya, Maldives, Maluku, Marianas, Marshall Is., Nansei-shoto, New Caledonia, New Guinea, Nicobar Is., Northern Territory, Ogasawara-shoto, Philippines, Pitcairn Is., Queensland, Samoa, Santa Cruz Is., Society Is., Solomon Is., Sri Lanka, Sulawesi, Sumatera, Taiwan, Thailand, Tonga, Tuamotu, Tubuai Is., Tuvalu, Vanuatu, Vietnam, Wallis-Futuna Is. Thuarea involuta (G.Forst.) R.Br. ex Sm.